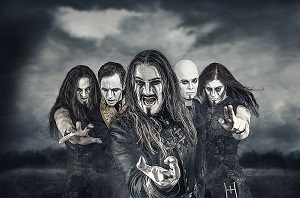 Powerwolf is now with Napalm Records. 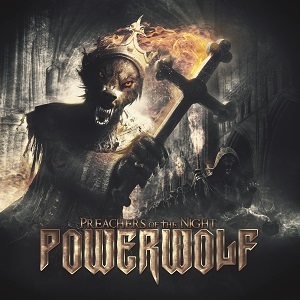 We were very excited to hear that Powerwolf had a new album. Since we loved"Blood of the Saints". Wishing for them to keep that over the top music with Attila Dorn doing what he does best with his impassioned, dramatic, theatrical approach that comes from his background singing and acting in the Romanian opera. The lyrics on Preachers of the Night f ollow the same formula as "Blood of the Saints", which is exactly what we wanted and expected. Yes, it's cheesy with repetitive choruses that are easy to remember – so go on, shout along at the top of your lungs, we know you like this stuff . Sing 'em in the shower so nobody will hear you. You know you want to! vivid, horror tinted music with shedding guitars and Falk Maria Schlegel takes you on a atmospheric journey with his keyboard contributions. “Amen & Attack", “Secrets of the Sacristy”, “Coleus Sanctus”, “Nochnoi Dozor” and “Lust for Blood” will be embedded in you brain for hours if not days if your not careful...So do yourself a favorite and get your copy and join the wolfpack!...... Attack! This record is tongue-in-cheek fun. Don't take it seriously and be happy!